ABC-Update is a FreeWare tool from ABC-Deploy.It can be used as a standalone tool, or in conjunction with software distribution tools like ABC-Deploy, MS SCCM and others.ABC-Update.exe have both a GUI and a command line version that sets you in control of MS Update operations.With ABC-Update you get the updates exactly when you want them, and can also define max reboots, use filtering options to select updates based on patch dates, KB Articles and update categories.You are in control. 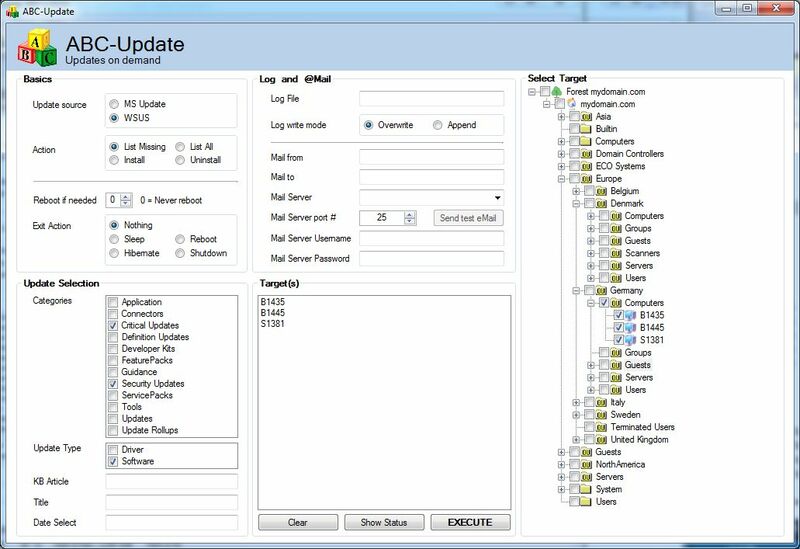 No more waiting for Automatic updates.Pick targets from AD and push updatesThis gap between what Microsoft is offering out of the box, and what many admins really wants is what the ABC-Update tool is made to fill. Presto Transfer Skype helps transfer your Skype Contacts and Settings from one computer to another. Quick Config is a convenient tool aimed to change quickly various settings of your computer. Presto Transfer Opera helps transfer your Opera bookmarks, mail, contacts and settings from one computer to another. Job scheduling software A-AUTO integrates batch automation across different platforms, for various applications, from information systems to mission-critical systems, providing nonstop job scheduling 24 hours a day, 365 days a year. The data acquisition software TWedge extends software systems with real-time data collection. Device data (RS232, RS485, TCP/IP, USB, Bluetooth) is captured automatically and forwarded to applications (ODBC databases, files, virtual keystrokes).